Jim's Journeys | Something NEW every day! Here I am enjoying the sea breeze as we leave Seattle. We were finally on board and sailing out of Seattle. The shadows and the clock make it obvious we are heading northwest toward Victoria, British Columbia. It is late afternoon or early evening and we are right on time. And then we had this wonderful view of Seattle… and the ship appears to be headed in a more southerly direction. Seattle’s waterfront with Ferris Wheel and Sports stadium. And then we had this beautiful view of the Space Needle and all its billboard information. Wait! Now the ship is headed in a south-easterly direction. Sadly, this photo shows a better shot of the billboards. The vista repeated itself a number of times. Believe it or not, it seemed our captain was doing donuts in Seattle’s harbor. About 45 minutes later, we were back where we had started. Our parking space was still available! As it turned out, someone on board choked on a chicken bone or something and it turned into a severe medical problem. We were doing donuts while the medical staff was treating the person. It was finally decided that the person needed much more serious medical care and we returned to port and the person was taken by ambulance to a hospital. At the time I felt really sorry for that person. In truth I still do to some extent. I initially thought the person was, like Lu and I, taking a cruise through the Panama Canal for the first time – a trip of a lifetime! In later days I learned that many of the folks on board had passed through the canal numerous times. Thus, the person with the medical emergency may not have been a first timer. In any case, it was sad. As we finally set sail for Victoria, Lu and I took the time to get familiar with the ship. When we upgraded to an outside cabin, we didn’t know if we’d get an actual window or a porthole. It wasn’t a big window and we had to crawl up on the bed to look out, but it was a nice view. Our room for the next 18 days. It isn’t a hotel suite, but it will do. The tables next to the pools had drink menus. Nobody was driving, so why not? The area around the pool was loaded with tables and chairs and deck loungers. The view between the pools and side of the ship. The openings on the right are showers for people who wanted to rinse off at the pool rather than returning to their cabins. Those showers were much larger than the ones in the room, but without doors one couldn’t really take a serious shower using soap and shampoo. I would include pictures of the buffet and other dining areas had I taken any. I’ll try to do better on our next cruise – assuming we take another. I believe it was on the first day that we also had to muster at our lifeboat stations for the safety instructions. This was not a way to win friends and influence enemies. First off, this was our second cruise on Norwegian. The first was on a larger ship and we sailed out of New Orleans. To receive our message of safety, we reported to the auditorium. This photo is from the Norwegian Cruise Line web site. The auditorium on the Norwegian Jewel was much larger than the one on the Norwegian Sun. Remember the first photo in this segment – the one with me standing all alone on a deck? This photo. Now, picture this deck with several hundred people standing and waiting for further instructions. Those instructions would not be given until all passengers were present and accounted for. We had to check in with a crew member and have our names crossed off. Fifteen minutes later, we were still waiting for the late comers to appear. Finally, after about 40 minutes, we were given the instructions. Of course, one person had already passed out by then. Perhaps they gave that person the instructions when he or she came to. It should be noted that since the cruise was 18 days long and went from mid-April to early May, there was not an overabundance of young families. Instead, there was an overabundance of walkers and wheelchairs. The bulk of the passengers were retirees and did not need to be standing – or sitting – out on the deck to hear instructions that most of us had heard before. So far, we had had a couple of bad experiences and heard some real horror stories. However, being retired and looking forward to our once-in-a-lifetime experience, we were optimistic that things would improve. We would not be disappointed. A few months ago my bride and I took a trip that had been on my bucket list for several years. Actually, it was a combination of two items – first, take a re-positioning cruise from wherever to wherever. Second, take a cruise through the Panama Canal. A re-positioning cruise is the result of a cruise ship company deciding to move a ship from one ‘market’ to another. In most cases, the decision is based on the calendar. For example, a ship that has been plying the waters of the North Atlantic is moved to the Caribbean in the winter months and then returned to the New England area for the summer travelers. In other instances, an older ship is moved to make room for a newer (larger and more luxurious vessel) that will accommodate more passengers in a particular ‘market’. The Norwegian Sun in Victoria, B.C. In our case, the Norwegian Sun, was being replaced by the Norwegian Bliss (the newest and one of the largest ships in their fleet). The Sun was being returned to Florida and assigned to cruise between Miami and Havana, Cuba. Thus, our cruise began in Seattle, Washington and ended at Port Canaveral in Florida. The best part of a re-positioning cruise is the price. The cruise line would rather not send an empty ship from one port to another for any reason. This is true in the airline industry as well as the trucking industry. If you can pick up a load and carry it to your destination and make some money in the effort, why not? The best way to get that load is to drop the price. Our 18 day cruise had a base price (inside stateroom) of about $900 per person, or around $50 per day. Thus, the two of us got to sail for $100 a day. A price that included a ‘motel’ room, numerous meals and snacks throughout the day, nightly Las Vegas style shows, other forms of entertainment throughout the day, a large swimming pool, and numerous other amenities. It cost very little to upgrade to an outside cabin, so we did. We started our trip a few days prior to the ship’s departure. This is good advice for anyone taking a cruise for two reasons. First, the cruise ship leaves port when it is scheduled to leave port. This is true almost 100% of the time. Second, airlines are not always as punctual. If your plan calls for you to fly to the port city the day of the cruise ship’s departure and the flight is delayed or cancelled, you may miss the boat. If you’ve already paid a few thousand dollars for that cruise, a day or two in a motel is a sound investment. Plus, it gives you a chance to tour the port city. In our case, the motel was basically free. I say ‘basically’ because we had to take a shuttle bus to get from the airport to a small town where we met my brother Doug and his bride Nancy. We then spent some time with them at their home in Port Townsend, Washington. 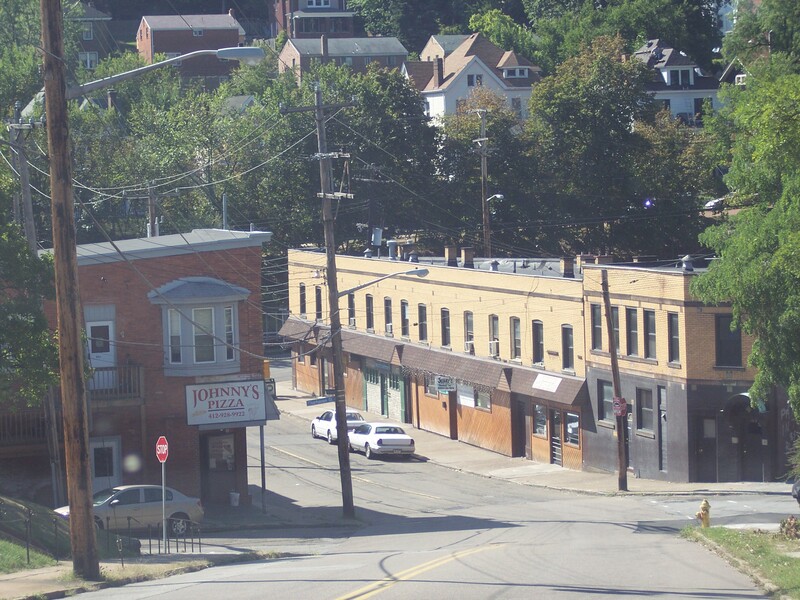 While in the area, we toured the town and learned that it had once been a thriving port – long before Seattle became the base for many cruise ships and cargo vessels. We also learned that the local government and chamber of commerce members are working hard to make the area a major tourist attraction. From our experience, I’d say it is worth the trip… even if you can’t stay with my brother for free. It wasn’t long before the city of Seattle came into view and I found myself disappointed by the ‘progress’. You’d have to magnify this picture quite a bit to see it, but the Seattle Space Needle is now plastered with advertising. Lu and I had been to Seattle in 1999 and ate at the restaurant that sits on top of the needle. It was much more attractive without the commercial messages. I’m sure it helps to pay their bills, but it is definitely an eyesore. Shortly after that photo was taken we spied our ship. Soon our ferry boat docked and we walked a few blocks and got in line to board and enter the cabin that would be our home for the next eighteen days. For whatever reason, we spent the next few hours sitting in a large room waiting to board the ship. It seems they weren’t ready for us. Even after we finally got on board, we were directed to another area to wait until our cabin was ready. During this time we learned all sorts of interesting tidbits about the Norwegian Sun. As I recall, the ‘cruise from Hell’ was a phrase used more than once! I skipped a lot of details. So before I explain the ‘cruise from Hell’ statement, let me list the specifics of the trip to this point. First, we drove from our home to a Holiday Inn near the Atlanta airport. We spent the night at the motel to be sure we would have no problem getting to the airport in time to catch our noon flight. That should tell you a lot about Atlanta traffic. We live about 60 miles north of the airport. To get there two hours before our flight would have put us in the middle of the morning rush hour. Smarter option? Spend the night at a motel and pay the few extra dollars. Our first flight was to Kansas City where we had a short layover and changed planes. That gave us a chance to grab a bite to eat and meet other travelers. We then boarded the plane to Seattle and arrived around 4:30 P.M. west coast time. From there, we took a shuttle bus to Silverdale where my brother and his wife met us. We then had dinner at a great Chinese buffet that also included steaks cooked to order! Finally, on to my brother’s home to spend the night. The next day was for roaming around Port Townsend and visiting a few historical sites. Another night in Washington and an early wake-up call so we could head to the Port of Seattle. That was accomplished beginning with my brother driving us to the ferry boat terminal. Thus, “Getting to the Port” was actually a three day event. Now, the explanation of the ‘cruise from Hell’. Our re-positioning cruise was actually phase two. The Sun had been used for Caribbean cruises and was being refurbished prior to taking on the Florida to Cuba route. Phase one was to move the ship from Florida to a dry dock in British Columbia for a complete refurnishing. As mentioned earlier, if the cruise line can carry paying customers and make some money on the deal, why not? Well the ‘why not’ was what made this cruise Hellish. Based on some top executive’s infinite wisdom, it was decided to begin the refurbishing effort during the trip from Florida to California. Thus, the ship not only carried passengers and crew, it also carried construction workers and their equipment. For the next two weeks, the passengers had to endure dust, noise, toxic odors, and various areas of the ship being roped off while decks were torn up and completely replaced. While the workers wore hazmat suits, the passengers were left to their own devices. The passengers insisted on meeting with the captain. He entered the room, blamed everything on upper levels of management and walked out of the room. It took less than five minutes and the captive audience could do nothing until they reached port in Los Angeles. At that point, they raised so much Hell with Norwegian Cruise Lines that they all received full refunds. Obviously, had we learned of this before we booked the cruise, we might not have made the trip. But, until we sat in the waiting room waiting to board the ship, we were totally ignorant. At that point, all we could do was continue on our way and hope for the best. We would not be disappointed! The way I see it, there are three types of people who frequent Facebook. This may also be true of the other social media networks, but I am only familiar with Facebook. If the other networks affected me in a similar fashion, I would’ve had a stroke a long time ago. The first of the three types of people on Facebook are those who stay away from politics and post nothing but nice friendly pictures, poems, videos, jokes, etc. I love those people. More often than not, they cheer me up and make my day. There is still hope for humanity. The second type are those who post political items without doing the slightest bit of research to verify the truth behind the claims. These people represent the extreme sides of both major political parties. Prior to the election, they painted Hillary as a saint and Trump as the Devil, or vice-versa. Since the election, Trump is painted as Satan (his own self), or the second coming of Ronald Reagan. Both sides irritate the hell out of the other. The third bracket belongs to people like me. Throughout this process I have tried repeatedly to demonstrate that no politician can be trusted and, for that reason, Trump might actually be beneficial – although I have no high regards for the man beyond the fact that he has not made a career out of living off the taxpayers as a member of some government. Obviously, it is the second type that drives me up a wall. Not only will they defend their posts while refusing to acknowledge that the posts may be out-and-out lies, they will attack my posts and insist I prove my statements. One person too lazy to do any research at all challenged me on the word ‘rioting’. I suggested they might consider the University of California at Berkley who stopped a gay Libertarian from speaking on the campus because the protesters considered him to be too Conservative. Too many people on the left (and yes, it is the Liberals) are more than glad to exercise their freedom of speech to stop anyone they disagree with from exercising his or her right to free speech. Yes, that upsets me greatly. If you refuse to even listen to the other side, how can you ever hope for compromise. And yes, it is the left – the side that preaches tolerance – as long as you agree with them. When is the last time a group of Conservative students stopped a Liberal from speaking on a campus? I was informed by people barely old enough to vote that American has never been as great as it is now. How do I argue with someone who is being indoctrinated by Liberal college professors? I would begin by taking a closer look at the unemployment rate. Obama is very proud that the number is under 5%. On the surface, that is a wonderful accomplishment. However, if one does the slightest bit of research, there are a number of factors that bring that number into question. Every month the government releases the latest figures of people who got jobs last month. I have yet to see that number top 250,000. So, based on that alone, the unemployment numbers should be going up. Unless something drastic has happened and I missed it, the population of the United States has also increased every month. I know there are many deaths each month, but the newborns more than make up for that. PLUS, we still have immigrants coming in on a regular basis. Somewhere along the way I’ve seen numbers representing the ‘under’ employed. Those are the folks who had decent jobs that were outsourced or sent overseas. Instead of making $100,000 per year as middle-management types, they are now working for much less money – but they are working and not part of the unemployment numbers. But the numbers are still questionable. The big question concerns the number of people in the labor force – a number that has dropped significantly over the last ten years. How can that be? I have friends and relatives who insist I am a Republican because I believe and say things like this. I then ask them “How many Republicans have no problem with gay marriage?” I also point out that while I don’t like abortion, I hate the alternatives, so I accept it as a necessary evil. There are a few other items that would label me as a Liberal, but that is only a small part of the bigger point. I could be wrong, but my guess is that the people on the far left and far right of the political spectrum are the vast minority of our citizens. Most of us are somewhere in the middle. But, thanks to the politicians and the news media, they have us at loggerheads. As for the media, I am convinced they have moved into the business of ‘making’ the news rather than simply reporting it. If they didn’t bother to cover the protest marches, would the protester even bother? And if they didn’t stress certain facts, would people get royally ticked off and go on rampaging riots? I heard a talking head question the Trump administration by asking “If they are doing such good and worthwhile things, why do they have minor things dominating the headlines?” Simple answer: So people will get upset and do more things for the reporters to cover. They are going out of their way to get juicy stories. In the meantime, I will stay off Facebook for a while and get my blood pressure back down to a reasonable level. Every time there’s a mass shooting, our government leaders renew the debate over gun control… ignoring the fact that in most cases, additional control of the legal sale of firearms would not have changed the outcome one iota. The Sandy Hook killings were done using the weapons of a family member. The guns were purchased legally. The Orlando murders were committed by a person who should not have been allowed to buy guns, but was. The existing gun laws were not to blame – the FBI’s process was. If the government can place a person on the “No Fly List” without due process, they should have been able to do the same when it came to buying guns. If nothing else, there should have been a ‘flag’ to let the FBI know the man had purchased weapons. Had a simple system like that been in place, they could have increased their surveillance and, hopefully, stopped him before he killed even one person. The debate will go on while the more serious issues continue to be ignored. Why is there a murder every two hours in the city of Chicago? Why do our government officials ignore that fact. Do those thousands of lives lost every year count less that the 49 killed in one night in Orlando? For that matter, was anyone else murdered in Orlando that night? Did that person’s life not mean anything because he or she died alone? The way I see it, murder is the result of a number of factors. The simplest one is rage – in all too many cases, rage directed at a family member or a close friend. Then we have the ‘gang’ related; in many cases caused by ‘turf wars’ in the dealing of illegal drugs. These are the cases where one, two, or three people are killed at a time. My solution for the gang related mayhem is to legalize drugs. Let government sanctioned outlets sell them so that the purity of the product can be more closely controlled and the tax revenues can be used to treat the addicts. Taking the drug dealers off the streets and out of the prison system will save lots of money and lives. As for family members killing each other, take away the guns and they’ll use knives or baseball bats. It has happened where a couple closing in on divorce settled the issue when one or the other was accidentally pushed off a cliff or assisted in drowning. In other words, rage is difficult to prevent, although if the rage is a result of mental illness, there is hope. My first job after college was at a mental hospital for children. It was part of a network in Western Pennsylvania. Within a twenty-five mile radius, there were at least two asylums for adults to go along with the one I worked at. Many of our ‘inmates’ graduated to the adult facilities. And then came along two factors that totally changed everything. One was President Reagan and his cut-backs. Federal funding for mental institutions dried up at the same time the A.C.L.U. convinced a judge that mentally incompetent people should not be held against their will. Brilliant! Very few crazy people readily admit they need help. One of the biggest problems with mentally ill patients is to have them continue to take the medication to control their behavior. Thus, we have people who were once safely cared for in mental hospitals (and forget the Hollywood nonsense that says those hospitals were all horror stories) now walking the streets forgetting to take their medicine. Since our government sees no danger, they are permitted to buy fire arms and, when the voice in their heads tell them to go into a movie theater and shoot those enemies of Bat Man, we have another mass murder that could have been prevented. How many times did a psychiatrist think there might be such a possibility, but said nothing due to another Federal law called HIPAA. So, there are my solutions to two of the root causes of murder; legalize drugs, and get mentally ill people the treatment and care they so desperately need. And that brings us to the biggest problem we face today – terrorism. We have huge segments of the world population who hate us… thanks to the propaganda distributed by many of the people we (our government) consider to be our friends. These same people, in many cases, are the ones we give millions, if not billions of dollars in foreign aid every year. We do everything we can in this country to encourage freedom of religion, but some religions use that freedom against us. In fairness, Christian ministers encouraged people to join the crusades a thousand or so years ago. So, I can’t blame religious leaders in the Middle East for returning the favor (they carry grudges for thousands of years in that part of the world.) What gripes me is the leaders in churches in the U.S. encouraging young folks to either go to the Middle East to help the effort there, or simply buy guns and bomb making materials and do as much damage as possible here at home. Sadly, there is no easy solution for this problem… any more than there was an easy solution for dealing with Hitler and the Nazis. The free world must come together to stop the terrorist groups. We need to be a part of that effort. There is a very old adage that says “Those who ignore the past are destined to repeat it.” Our current leaders decided that the wars in Iraq and Afghanistan were over and our troops needed to be brought home. Those leaders ignored the fact that we still have troops in Germany and Japan. Lasting peace doesn’t happen overnight. It took decades for the peoples of Germany and Japan to realize we were there only to keep the peace – nothing more, nothing less. Any remnants of the groups that did not like losing World War II eventually were won over to the improvements brought about through peace. We cannot force any nation to become a democratic republic such as ours, but we can help them peacefully establish governments that work for them. The shopping area near my childhood home. Over the years… starting as a young child selling hand made pot holders door-to-door so I’d have money to buy Christmas presents for my family, I’ve been involved in many fund raising activities. In high school, I was a member of the Key Club (a junior Kiwanis club) and distributed local phone directories in exchange for donations. I also helped sell Christmas trees to raise money for our charitable pursuits. During my college years, I volunteered as a tutor at the local high school, but my fund raising activities were focused on paying my tuition, room and board, and occasional glass of beer. After college, I got involved with the LIONS club and sold brooms, light bulbs, fruitcakes, pancake breakfast tickets, and raffle tickets among other items. At church, I’ve been involved with yard sales, Irish dinners, auctions, and numerous other fund raising efforts. Is it any wonder that somehow I got snookered into being the Fund Raising chair of our local Family Promise affiliate? Family Promise is an organization whose mission it is to help homeless children and their parents get back into a home of their own. For more information on Family Promise, I invite you to visit the Family Promise web site. My past endeavors were small potatoes compared with my current challenges. In the past, the most money raised by any of the things I worked with was a few thousand dollars. Now I’m faced with raising at least $50,000 to get the program started and then meeting an annual budget of over $125,000. In less than a month we will hold our first major fund raising event. 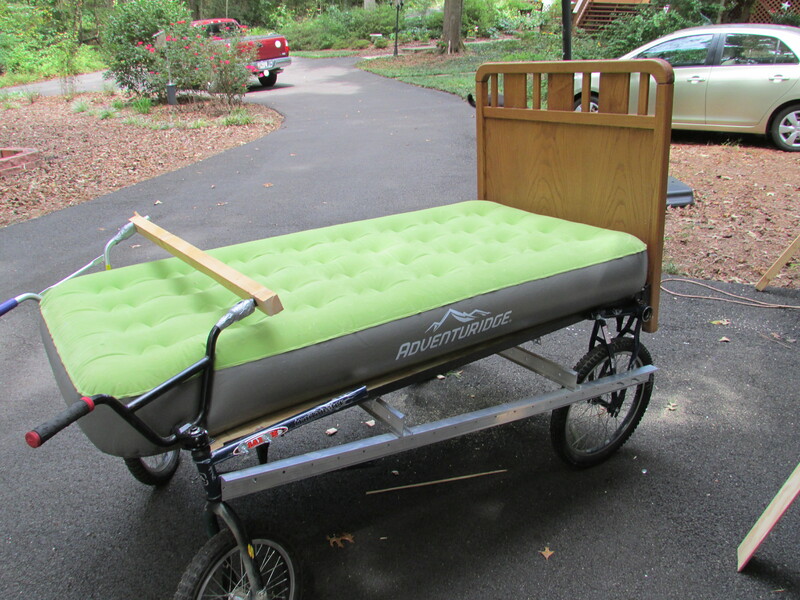 It will be Bed Race & Festival. On November 7th, we’ll welcome local citizens at 9:00 AM at Forsyth Central High School where they can visit at least 14 booths selling various items, have their child’s face painted, or let their child create a work of art that will be donated to Children’s Healthcare of Atlanta for another fund raising event. The bed races will begin around 10:00 AM. Each team will compete in two heats and their time will be recorded. The two teams with the fastest combined times will then compete in the finals at noon. While there will be a trophy for the team with the fastest bed, the big prize – the coveted Brass Bed award – will go to the team that raises the most money for Family Promise. As of last night, my friends and family have donated almost $900 to Family Promise in support of my bed entry. I’ve given my bed the title of “First Day of Retirement” and it will be pushed by a group of retired senior citizens. Our goal is to prove that old age and treachery can defeat youth and enthusiasm any day of the year. If you like that thought (regardless of your age) I’d appreciate your demonstration of support… in terms of dollars donated to Family Promise. You can make a donation to my bed or any of my competitors by going to our local local Family Promise Bed Race page. Obviously I feel very strongly about Family Promise. Forsyth County, Georgia is one of the wealthiest areas in the country and yet, as of this past Thursday (October 8th) there were three hundred forty-three children considered homeless since the beginning of the current school year. A child is considered homeless if he or she is living with friends or relatives, living in an extended stay motel, living in a tent or camping trailer, or living in the family car. You can also help the cause by buying any of my e-books that are available for your Kindle or Nook. I’ve stated that I will donate half of my royalties to Family Promise. If need be, I’ll give it all to Family Promise. Pure and simple, I cannot do this alone. I need all my friends, family, readers, casual acquaintances, and everyone else to chip in. We have almost 200,000 people living in Forsyth County. If I could find a way to obtain at least $1.00 from each of them, we’d have the money problem solved. Sadly, I have yet to figure out how to do that. So, I’m reaching out to everyone I can think of. I already received backing from a friend in London, England. Let’s see if we can get donations from other parts of the world! Please spread the word! Thank you kindly. Semir (Sam) Osmanagic is a Bosnian American archaeologist. He has spent years studying the pyramids of Latin America and believes that certain mountains in Bosnia are, in fact, also pyramids. Of course, the ‘experts’ have scoffed at the idea… just as the ‘experts’ scoffed at the idea that dinosaurs were birds rather than reptiles. One of Osmanagic’s findings showed that electromagnetic pulses were emanating from the top of the Bosnian pyramids. What if that is true? What purpose would such signals serve? 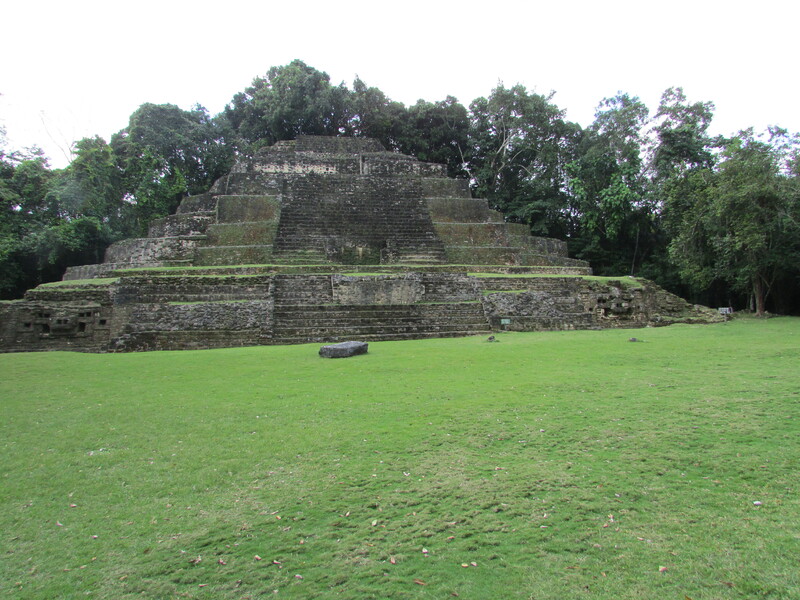 After visiting ancient ruins in Mexico, Belize, and Peru, the author of “If the Sky Should Fall” has his own thoughts and theories about ancient aliens, UFOs, and pyramids. If you’re a fan of television shows such as Ancient Aliens, History Unearthed, Hanger One, The Unexplained Files, and Ancient Discoveries, or books such as “Chariots of the Gods” by Erich von Däniken, you will find “If the Sky Should Fall” a compelling read. While it may well be a book of science fiction, the author raises a number of questions to make you stop and ask yourself, what if it were true? Life on our planet and throughout our solar system may, in fact, depend on the actions of aliens. They may be living among us and keeping us alive. Why would they be doing that? That’s a topic for another discussion. Obviously I am a fan of all those TV shows I mentioned as well as a reader of books similar to “The Chariots of the Gods.” But watching those shows and reading those books, combined with traveling to ancient ruins and seeing the amazing constructions done by ‘primitive’ people, leads me to ask even more questions. And I can’t help wondering why mainstream scientists are so quick to laugh off the possibilities. Those are the folks who believed that uranium was a worthless metal prior to the 1940’s. It’s difficult to watch these programs and not ask how the ancient Egyptians, Mayan, Incas, and others could build such structures. More importantly, I kept asking myself WHY? Did these folks have nothing better to do? Then I found myself wondering if there might not be pyramids right in my own backyard? The ones that have been discovered in Central America, for the most part, had been hidden from view for centuroes by dense vegetation. How many mountains in the United States are also covered in dense vegetation? 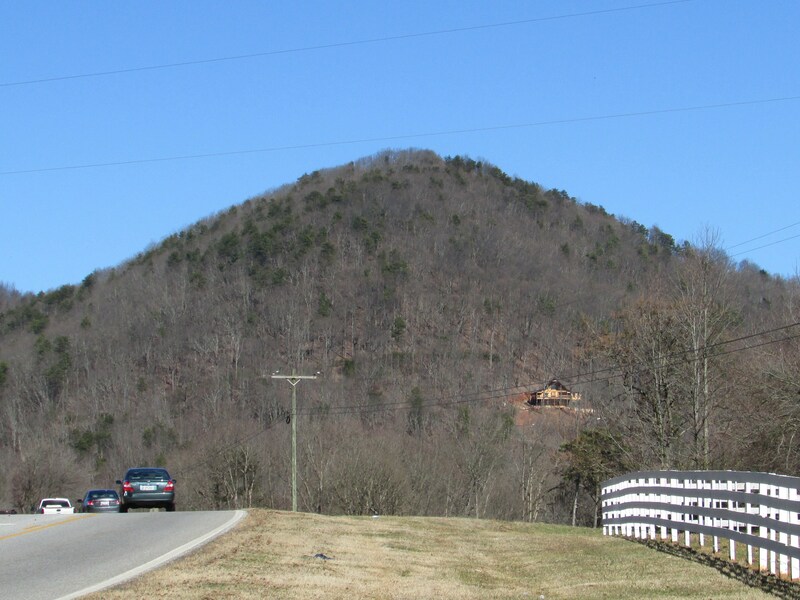 This mountain in North Georgia sure looks like it could be covering up a pyramid. And there are many more like it. Sam Osmanagic really got me thinking when he discovered electromagnetic pulses emanating from the tops of the ‘mountains’ in Bosnia. What if they really were signals to aliens? What if that mountain was serving as a light house for space craft navigation? The more I thought about such things, the more “If the Sky Should Fall” wrote itself! I am in a comfortable point in my life where I am retired and, although living on a fixed income, my lifestyle does not require lots of money. My bride and I own a lot at a camping resort and a small trailer. We love taking our grandchildren camping for a week or so at a time. Otherwise, we are basic home bodies who take one or two trips a year. We are extremely active in our church and community. Currently we are deeply involved in a program called Family Promise, which aims to help homeless children and their families. That is why I am dedicating 50% of any royalties to that charity. If you are at all interested in the ancient aliens theories I think you’ll like my book. More importantly, if you’d like to support a program that helps homeless children, I ask that you buy the book for their sake. Let me know what you think of it and how many questions it raises in your mind.